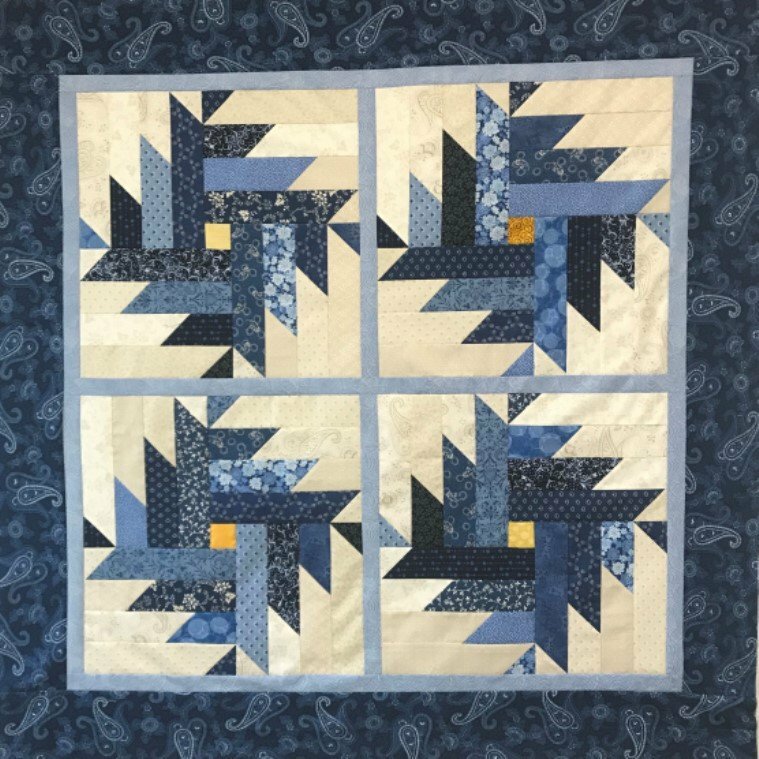 Take a break from rulers and tools and still maintain accuracy using a unique technique to construct this quilt. All you need is a layer cake (10" squares) and some yardage for the background. Approximate size is 65 x 83…but the size can be adjusted by changing the number of blocks. This is constructed using large half square triangles which are 'sliced and diced' and rearranged. Due to the unique way this block is constructed, you will have limited intersections and bulky seams to deal with. So grab a layer cake or cut 10" squares from your stash…select a neutral background and enjoy a fun day with other quilters. The pattern may be purchased at Stitch-N-Time! Approximate Size is 65" x 83" unless you decide to make something smaller like I did. 1 fat quarter for flower centers unless you decide to use one of the fabrics you already have. I simply used some yellow scraps for mine. There are fabric requirements for sashing, border, binding and backing, but you will not need these for class. We will be focusing on making the blocks in class. Yes, you do need a sewing machine for this class! If you have a large 12" square ruler, bring it. I will have my Tucker Trimmer III if you need to use it. It will only be used to square up each of your blocks. You need a marking pen/pencil! If you have a Quilter's Magic Wand, bring it...but it is totally optional! Make sure you bring one ruler that is at least 12" long! Example: 12" x 6" is a common size that many people already have. A small rotating cutting mat is always handy to have. If you have questions, please email me at: ladyloves2sew@yahoo.com OR, for those on Facebook, you can send a message! I look forward to seeing everyone in class. You have going to love this pattern. It's easy, fun, and stress free!